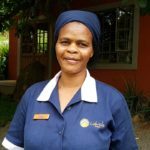 Jabu joined the Lidwala team as a cleaner in 2011. Being from the local community and a mother, she has ample experience of the area. She performs a variety of cleaning duties to keep the lodge sparkling. She coordinates very well with other cleaning team mates and works independently with passion for what she does.